This is an annual subscription for a membership in the Lifestyle Design Studio, an online community for high-achievers who are ready to make a serious commitment to their health. As a member of the Studio, you’ll learn how to use Living Upp’s 8-Dimensional framework to make simple adjustments to your current lifestyle so you can begin experiencing better health, more balance, and greater joy. This is an annual subscription for a membership in the Lifestyle Design Studio, an online community for high-achievers who are ready to make a serious commitment to their health. Whether you’re a business owner, entrepreneur, digital nomad or executive, your health is your greatest asset. 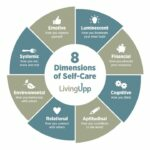 As a member of the Lifestyle Design Studio, you’ll learn how to use Living Upp’s 8-Dimensional framework to make simple adjustments to your current lifestyle so you can begin experiencing better health, more balance, and greater joy. Once enrolled, you’ll have immediate access to the Studio on the Living Upp website, so you can get started with your lifestyle design right away. You’ll also have at your fingertips a wide variety of self-study tools, like the Self-Care Starter Kit, the 8-Day Self-Care Challenge video series, a digital copy of Uppward: A Self-Care System for Purposeful Living, and a host of other resources. You’ll be invited to join live monthly group calls with Stacy (via Zoom), where you will have an opportunity to ask questions and expand your knowledge of the lifestyle design process. The Lifestyle Design Manual includes training modules, worksheets, journaling prompts, lists, and tips to help you begin experimenting with new strategies to tailor your lifestyle plan. You’ll have the freedom to go at your own pace at a time that’s most convenient for you. Connect with others in a private Facebook group, where you’ll be able to interact as little or as much as you like with an active community of other high-achievers who are committed to improving their health. Ask questions and in safe, nonjudgmental space and get support and encouragement from other brilliant members. You can also access monthly coaching call recordings in case you miss the live calls. As a bonus, you’ll have the opportunity to purchase private coaching sessions with Stacy, an option available only to Studio members. Get immediate feedback and answers to your questions so you can move through obstacles quickly and easily and take the necessary action to achieve your goals. Personalized coaching can be a powerful catalyst for change, providing additional motivation and accountability, especially if you tend to fall back into familiar patterns easily. People just like you join the Lifestyle Design Studio to gain the motivation and confidence necessary to make lasting changes. Prefer a monthly membership? Click here.